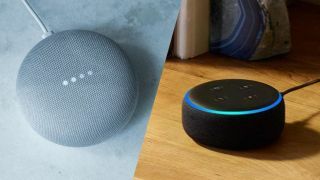 If you're looking to get into the world of smart speakers or add another one to your home setup, then this is a fantastic opportunity to do so for way less with either the Amazon Echo Dot or Google Home Mini. Amazon has just launched its Spring Sale, with lots of tasty discounts, especially on its own devices. And our favourite so far is the latest version of the Amazon Echo Dot for just £29.99. As sunshine follows sunrise though, whenever there's a great Amazon Echo deal to be had, Google isn't far behind to match it with a great Google Home Mini deal. So you'll also find the rival smart speaker has been discounted elsewhere to just £29. Both speakers are excellent smart home devices and can be used to for multiple voice-activated requests. Everything from asking for the news and sports scores and random questions, playing music to controlling smart bulbs and thermostats and a more. This is the best price Amazon's most popular smart speaker has been this year. Actually, after a massively successful Christmas sales season, it was sold out until late March, making today's £20 discount even better. This is likely to be the best price you'l see before the Amazon Prime Day deals event in the summer. Not sure? Check out our full Amazon Echo Dot review. Amazon's newest Echo Dot might just about have the edge in terms of audio quality, but we've found Google's range of smart speakers to be well, a bit smarter. That's thanks to Google's enormously powerful Google search engine being behind it for all your random questions. Better yet, as this offer is from John Lewis, you're also getting a two year guarantee. Here's our full Google Home Mini review. Fancy checking out some more deals from Amazon today? Our phones team has selected the best Amazon mobile phone deals from today's Spring Sale. There are some chunky discounts on games, smart home devices, Kindles, phones, Simba mattresses, laptops and more. Head on over to the Amazon Sale homepage for more.